Alcohol concentration is usually rated using by the percentage in volume of alcohol (% abv). 1 litre of a 30% abv spirit contains 30 cl of pure alcohol. Another measure is the US proof wich is twice the value of % abv. 1 litre of a 30 US proof spirit contains 15 cl of pure alcohol. A.O.C. stands for Appellation d'Origine Contrôlée. It is a French certification awarded to some French products (wine, cheese...) produced in a designated place and according a designated manufacturing process. 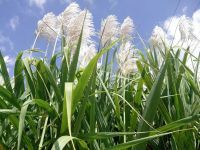 the dry dusty pulp that remains after juice is extracted from sugar cane or similar plants(Wordnet dictionary). Bagasse is often used as a fuel to provide energy to the facility. Sugar concentration measuring unit. A 25°Bx (brix) liquid contains 25g of sugar and 75 g of water, in other words, 25g of sugar in a 100 g juice. C4 plants are plants which use more carbon to grow than average plants. 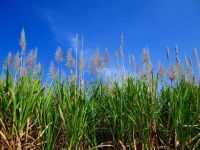 They are hence far more efficient in carbon trapping and require usually more water and heat than C3 plants. 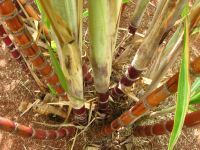 Sugarcane is a typical C4 plant. For further detail, please see Wikipedia article. Yeasts can be put to "sleep" by dehydration through centrifugation. This technique is seldom used apart from industrial processes as the time lag between fermtation beginning is quite high. Contamination risks by other strains are hence higher in non fully controlled environments. Discontinuous fermentation is opposed to continuous fermentation where liquids from drained the fermentation tank are replaced by fresh juice, allowing a continuous fermentation. The section of a column situated above the feed point. The trays of this section do not handle the liquid fed into the column but rather make the vapour coming from below richer in alcohol. Which releases heat, mainly said of chemical reactions. 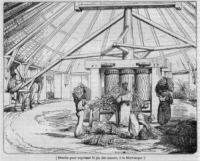 In the French West Indies, distilleries still in operation are said to be fumantes (French for smoking). Hectolitres of pure alcohol. Measurement unit used for distillery production or capacity. It measures the alcohol produced and not the volume of spirit produced. It is therefore independent from the dilution of alcohol in the spirit. Heads are the first parts coming out of a distillation process. Heads are made of the most volatile parts of the liquid to be distilled. In alcoholic distillation, heads are usually made of methanol and acetone, unpleasant or event toxic products. That's why heads should be discarded to maintain the quality of the produced spirit. Heart is the part coming out of a distillation process between heads and tails. Heart is the part retained to make the spirit. Master batch is pitching technique where a first batch is pitched and heated to foster fermentation. As soon as fermentation is well established, the batch is mixed with other batches as a starter. A thick syrup left after all the raw sugar has been extracted during the refining process. Its colour usually ranges from light to dark brown. 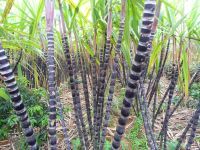 Molasses are the main ingredient to non agricole rum production. Acidity measurement unit of a liquid, usually an aqueous one. The higher the pH is, the less acid the solution is. A pH of 7 means a neutral liquid. Vinegar pH usually ranges from 2 to 3 and Sodium hypochlorite has a pH higher than 11. "Pitching" is term use in brewery and means adding yeast to the liquid to be fermented. Harvesting techniques which leaves the root system along with part of the stem. This techniques simplifies field management (nor plantation required for fresh plants) and allows a stronger and earlier start of the next season. Rectification is the process of repeated distillation of a liquid to produce a spirit with a high concentration of ethanol. Rectified spirits are stronger in alcohol but usually with weaker aromas. This technique is strictly forbidden by the agricole rhum specifications. In the distillation context, reflux is the part of the condensed vapours that are reinjected into the distillation column on the upper part of the column (the enrichment section). Reflux reinjection provides better extraction rates for the column, producing spirits with higher concentration in alcohol and aromas. Saccharomyces are yeast (fungi genus). Yeasts are used to porduce alcohol or to make the bread rise. Most common yeasts are Cervisae (from latin cervisae: cervoise, a kind of beer). A starter is a brewery term designing a solution of highly active yeasts which is pitched into the solution to be fermented. A starter reduces the lag time before the beginning of fermentation, hence reducing contamination risks from other strains of yeasts or bacterium. The section of a column situated below the feed point. The trays of this section make ascending vapour bath in pools of descending liquid. Vapours get richer in alcohol and aromatic compounds as liquids get poorer. Tails are the last parts coming out of a distillation process. Tails are made of the least volatile parts of the liquid to be distilled. In alcoholic distillation, tails are usually made of propanol and organic compounds. Tails are highly aromatic though sometimes in an unpleasant way. Finding the separation between heart and tails is a difficult quest between pleasant and unpleasant aromas. Spirits without any or few tails tend to be without any aroma, spirits with more tails have more aromas, the difficult point being to find the right time to stop before unpleasant aromas. Terroir ([tɛʁwaʁ]) is a word coming from the French word terre(land). At first used in the wine context, it denotes the specificities of a geographic origin, its soil, climate, growing techniques,... All those specificities contribute to the product uniqueness. Trays or plates are horizontal devices inside a distillation column. Each tray represents at a different set of temperature and pressure an equilibrium between vapour and liquid. Trays look much like plates with various devices designed to force contact between liquid and vapours. Vésou is the way fresh sugarcane juice is commonly named in the French West Indies. vin is a generic term used in distillery process to name the the alcoholic liquid which will be distilled. In the rhum context the vin is made of fermented vésou. Vinasse is the liquid left after the distillation and the removal of alcohol from the vin. Vinasse can be used as a fertilizer or to produce biogas in an apparatus called thermophilic digester.